Focus on the good things. Even when they’re simple. Then bury them deep so only you know where they are. There is eternal and ethereal beauty in Mia Sheridan’s words. Beauty that breaks. Beauty that bleeds. Beauty that bonds. Beauty that breathes in every word. I was BREATHLESS after breathing the broken beauty, Most of All You. From the moment I began Most of All You, my heart was stripped bare—both shattering and soaring—as this story held my heart in its hands. Tethering itself to me, this tale twisted itself around my heart and never let go. Beautiful and broken, Eloise, has been knocked down her life, a life of constant loss. Her heart is practically encased in armor, protecting it…protecting her. She has lost trust in the world, one that has constantly let her down. Eloise had given up on hope until an angel crosses her path. Something about her…called to me. Strong. Soulful. So beautiful inside and out. Gabriel has survived hell but lives as if he were in heaven…seeing the light among the darkness. I LOVED this hero so much, an angel who held my heart in his hands!!! I ADMIRED this hero’s tenacity and tenderness, such a stunning combination for a stunning soul. He was asking too much, and I had so little to give. A force pulls an angel to a broken soul—light to dark—a force of FATE. Gabriel sees the inner beauty shining through the pain…the promise…the potential. I MELTED from the MAGIC of this couple. I felt their UNDENIABLE CHEMISTRY and CONNECTION. I felt this hero and heroines’ SPARK too—their spiritual presence—as if they were soulmates. These words?!? Through the heartfelt characters that Mia Sheridan flawlessly brings to life, I felt every emotion of theirs as mine. This book’s beauty bled through me, straight to the heart and soul. Most of All You is full of passion, poignancy, heartbreak, hope, healing, and a piece of heaven from above. I felt so many emotions entangle around every part of me. I FELT every word. I FELT EVERYTHING!!! After the storm comes the sun. Where there is darkness, there is light. Where there is heartbreak, there is hope. Where there is hope, there is healing. I was lost and the only one who could save me was myself. My soul?!? Oh did my soul SHATTER and SOAR!!! This soul-shattering and soul-slaying story brought me to tears as every emotion was felt…every feel…EVERYTHING!!! Each broken character broke off a piece of my heart that Mia Sheridan mended in the most beautiful of ways. Most of All You is so HEARTBREAKINGLY BEAUTIFUL!!! A visionary, a romantic, a dreamer, and a believer, you can’t help but feel Mia Sheridan’s heart and soul through her writing. With wondrous words filled with passion, promise, and poignancy, Mia Sheridan makes you believe in love against the odds…believe in light after darkness…believe in a spirit on earth…believe in the impossible. I forged a DEEP CONNECTION to this beauty in words, one so spiritual and soulful, where it felt as if I were dreaming while reading. Most of All You made me melt…made me break…made me think…MADE ME FEEL. Sometimes that’s all hope is—just a sliver of distant light. Complex yet simple. Dark yet light. Heartbreaking yet healing. 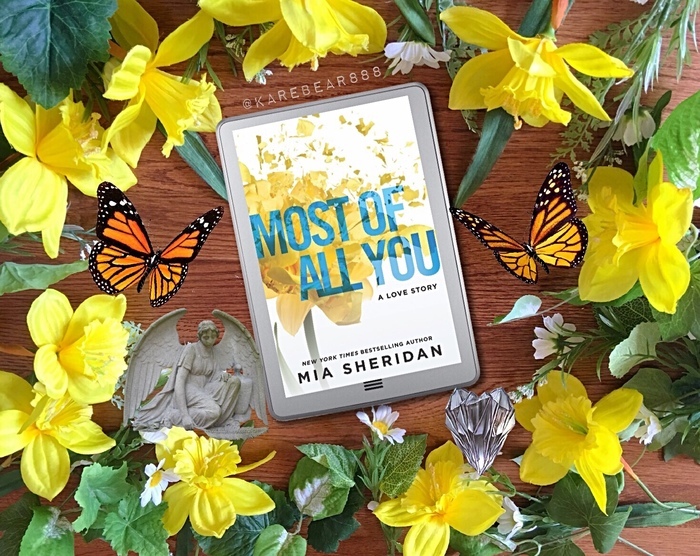 Through symbolism and a spiritual presence infused with fate, Mia Sheridan brings hopeless to hopeful and love to life with words so full of PASSION that you can’t help but feel their POWERFUL PULL and tender touch. This story is SPECIAL—not just a romance but a life-altering journey that marks the heart and soul. Most of All You, has left an everlasting imprint on my heart…my soul…me. I’m tethered to this tale that is so touching, one that made my heart both fall and fly. Most of All You became most of all me. Tell me I’m going to soar, Ellie. A TOP 2017 & MUST-READ ROMANCE!!! What would you be if you weren’t a writer? What or who gave you the inspiration to write this book? What food could you eat every day and still love? What show is your guilty pleasure? Describe your ideal ‘me’ day. A quote I read last year (often attributed to Bob Marley) was the initial inspiration for this story. It goes: ” If she’s amazing, she won’t be easy. If she’s easy, she won’t be amazing. If she’s worth it, you won’t give up. If you give up, you’re not worthy. Truth is, everybody is going to hurt you; you just gotta find the ones worth suffering for.” It totally knocked me for a loop and I couldn’t stop thinking about it. Crystal and Gabriel were formed from my musings on those words. Potatoes in any and every form. I never met a potato I didn’t love. I am super interested in this book, mostly because you love it so much! I’m in the mood for a good love story, a hopeful one, one inspired by Bob Marley 🙂 We are all imperfect, and loving one another in spite of (or because of) that is beautiful. Love this review!